I received several emails during the past few days from folks wondering what happened to the Bald Eagle I was waiting for from Marinette about midnight Friday. I would love to say it was a success story, but it was not. The beautiful adult Bald Eagle died before she arrived at our clinic. The kind folks that found her were in route and still about 60 miles from our clinic when the eagle died. They continued on their way, however, so we could do testing to find out what happened to this magnificent bird. I usually don't put photos of deceased patients on the blog unless it serves a distinct purpose. I hope the photo below is helpful in urging people to try to find lost fishing equipment and not discarding broken line, etc. in a lake or river. I cannot say enough about the terrific people who found this bird. They saw her while fishing earlier in the day and again in the same place as they were coming in for the night. They knew that was odd so they called for help. We have no volunteers in this remote area. This special couple carefully caught her up and began the trip to Antigo, knowing they would arrive about midnight (and a 2 hour trip home once leaving off the bird). It is people like this that make the world a better place to be. Sadly, the Bald Eagle also had a hole in her lower mandible where a hook had been. She weighted only 5 lbs., which is less than 1/2 what she should have weighed. That indicates she was at least 10 days and probably more with the lure embedded. She was unable to eat. She was an older female and likely had been in the area for quite some time as Bald Eagles are territorial and occupy the same territory for many years. We are doing tests to find out if there was something else such as lead poisoning involved. The preliminary testing, x-rays, revealed no lead shot in the body. The blood tests will take a few weeks. For right now it looks like the Bald Eagle died of starvation and exhaution from trying to free herself from an impossible situation. 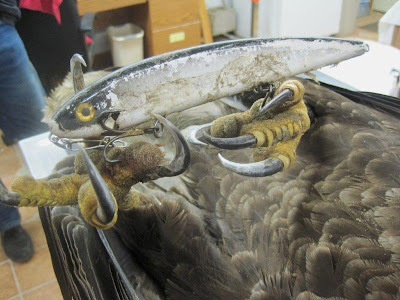 You can imagine the eagle curled over with hooks in both feet and lower beak for at least part of that time as she tried to extricate herself from treble hooks. The hooks that are made specifically so fish cannot get away. Please be mindful of your fishing equipment and monofiliment line and encourage those you know to do the same. I am a fisherman. I am well aware lures are lost when fishing. Some are impossible to retrieve. Many more are simply discarded if broken or are no longer wanted. The same properties that make monofiliment line so great for fishing, make it impossible for wildlife to free itself once tangled. Please keep wildlife in mind when your restring a pole or cut off bits of weak line. If you find discarded line along a pond, river or lake, pick it up and discard it yourself to avert this kind of tragic situation. This Bald Eagle would be in the sky above Marinette now had someone been more careful. It has been crazy busy here at REGI with many patients admitted including another Bald Eagle yesterday, more patient releases and end of school year programs. I will catch up today so stay tuned on the REGI blog for some good news next time. Dear Marge and other special volunteers. Thank you for posting the information about the tragedy this beautiful Eagle suffered. We were so hoping that she would survive. Some relief? in knowing that we did all we could for her, but that her ordeal was just too much for her. Be assured we will spread the word about the work you do, and to let other concerned citizens of our state know that you are there to help. God bless you all and the valuable work that you do. 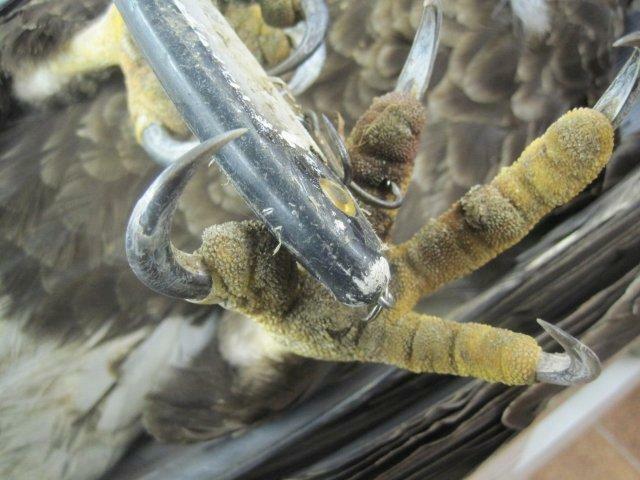 Sincerely, Cyndi Tonn and Jeff Philipps - rescuers of the bald eagle on this blog.